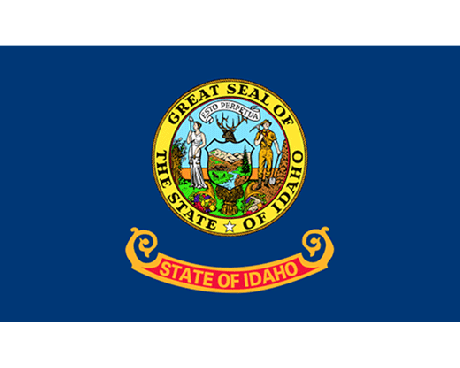 The current Idaho state flag came into use in the middle of the 20th century, but the seal on it has represented Idaho for a much longer period of time. The seal was adopted many years before Idaho became a state in its own right, which makes it one of the most enduring symbols of Idaho. 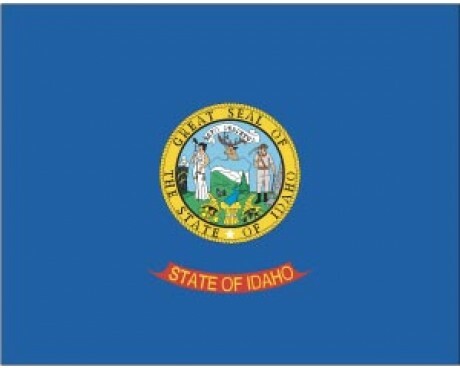 Idaho state flags have dark blue fields that display the state's seal in the center above a red band that contains the words "State of Idaho." The seal displays the state's Latin motto over a detailed scene. The seal contains a woman in a classical dress and a man dressed as a miner who are standing behind a pair of cornucopia. A shield that depicts the state's natural wonders is between the two people. The woman is a representation of justice, while the man represents the mining industry that dominated Idaho during the state's early history. The cornucopia represent the prosperity that comes from Idaho's natural resources, and the rest of the design is dedicated to representing those resources, which range from woodlands to wildlife. 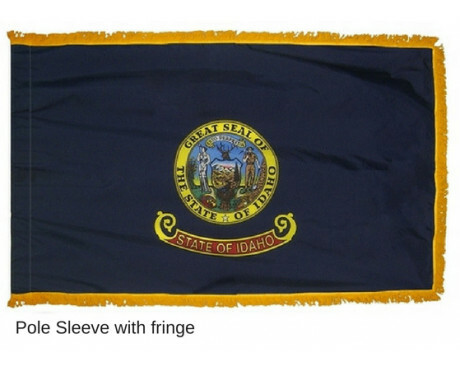 The story of the Idaho state flag is also the story of the state seal. The seal has dominated every flag of Idaho, but the precise form has varied over time. The earliest form of the seal was adopted in in 1863, which was almost thirty years before the Idaho Territory became a state. A painter named Emma Edwards Green designed the original seal, which was the only state seal to be designed by a woman. Her design had the same emphasis on the state's natural resources as the modern seal, but it lacked the references to the state's industrial heritage. The seal was changed in 1866, and it reached its final form in 1890. The state seal first found its way onto a flag in 1898, when it was used to represent military regiments that were raised in Idaho. 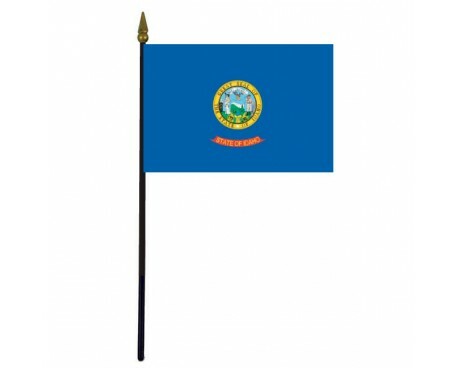 The legislature of Idaho authorized the adoption of Idaho state flags in 1907, and the government chose to honor those regiments by adapting their military banners to serve as the state flag. 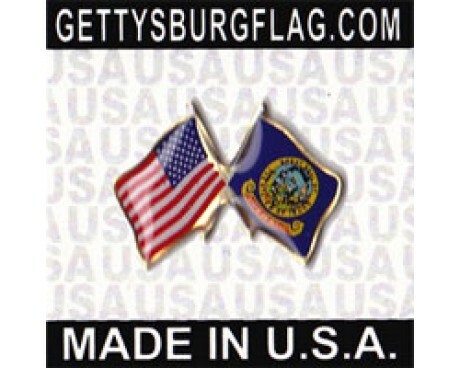 The form of the seal on the flag has changed slightly since it was first adopted, which led to the modern flag being authorized for use in 1957. Idaho was given state hood in 1890, and some aspects of its old Territorial seal were incorporated into the new state seal, which was designed by Miss Emma Edwards. On one side of the coat of arms, supported by the female figure of Liberty and Justice, and on the other side by a miner carrying a pickaxe and shovel. Included in the shield was landscape of the state tree, and the Western White Pine, and surrounding the shield were two horns of plenty, a wheat sheaf, some vegetation and rocks. Within a scroll of the crest was an elk's head with the state motto. 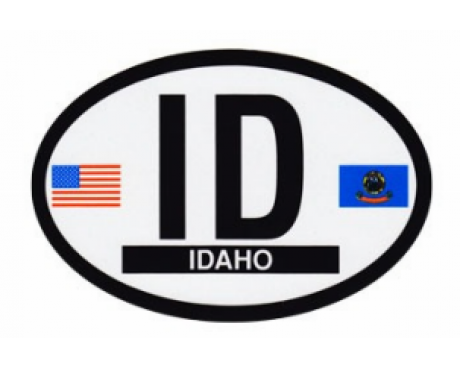 To indicate that Idaho was a new state, one star at the foot surrounded the rim. 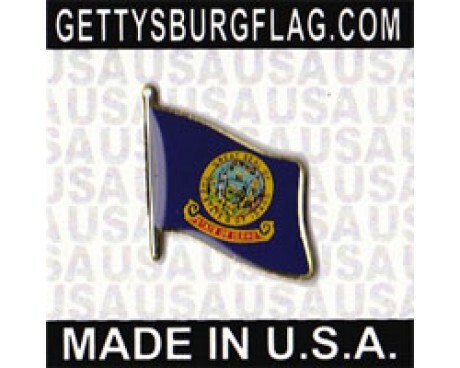 In 1907 the first flag called for the name of the state to appear on a field of blue, and the seal appeared in full gold color. In March 1927, legislation authorized the flag, and thirty years later Miss Edwards' surviving (original) artwork was brought into use for both the flag, and the original seal. Idaho is located in the north-west, and was once part of Oregon, and was shared between the USA and Britain during 1818-48. After the 1860 gold strike, settlers and miners arrived, and Idaho became a Territory in 1863. It was admitted to the Union on July 3, 1890.